This is a part of Grain Free Baking Week at Health, Home, and Happiness! We are baking a few recipes from the Nourished Kitchen Guide to Grain Free Baking and Treats. My children were so impressed with this cake, and honestly so was I! 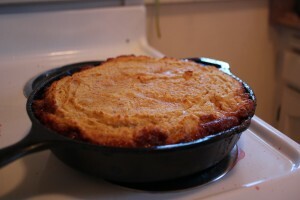 It’s cooked in a cast iron skillet, which gives it a golden brown crust that is delicious. “A flower cake!” my daughter said when I flipped it out, yes, it’s a flower cake, I love that sweet girl. This recipe from Nourished Kitchen is sweet and filling and has a beautiful presentation, be sure to bake this when you have company. Melt coconut oil in a 12-inch cast iron skillet over moderately high heat. Whisk in remaining 1/4 cup honey. 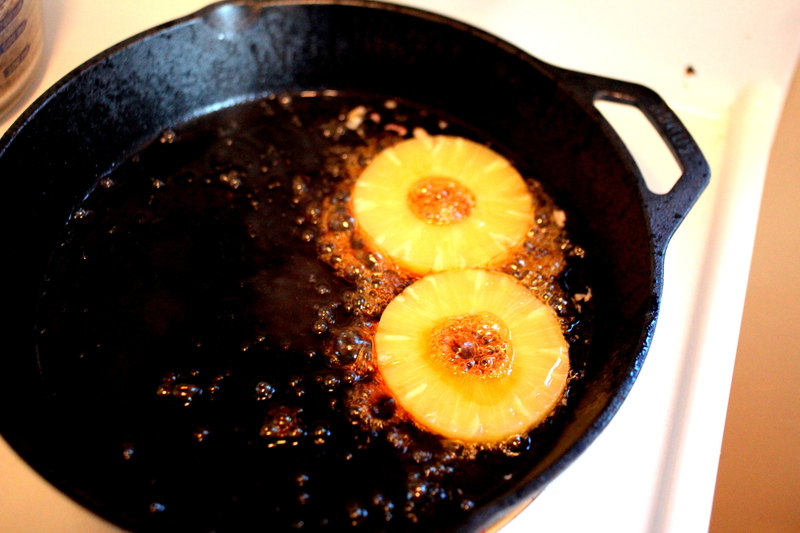 When the honey and coconut oil foam and bubble, gently arrange pineapple into the skillet. Place dried cherries in the center of each pineapple ring and around the rings. Turn off the heat, pour inthe cake batter, and bake for 45 minutes to 1 hour in an oven preheated to 350 F or until a toothpick inserted into the center of the cake comes out clean. 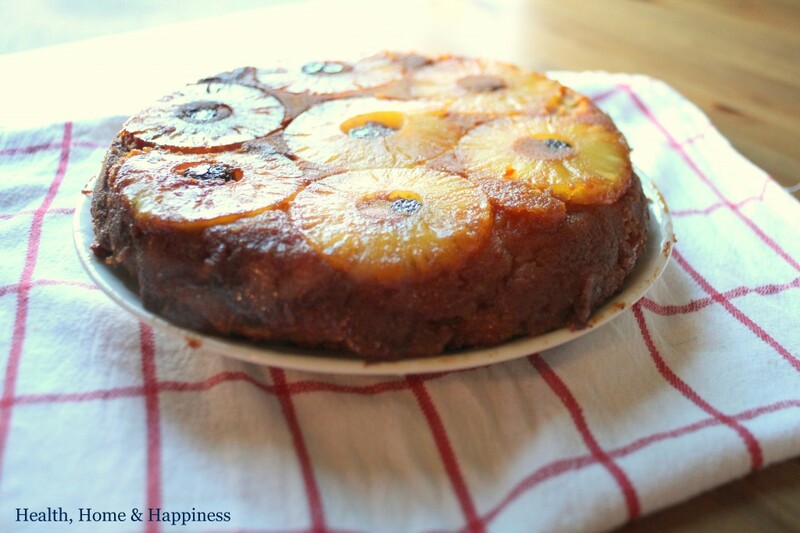 Allow the cake to cool for 5-10 minutes before inverting on a platter and serving. 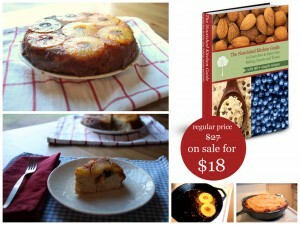 90+ recipes for breads, biscuits, scones, cupcakes, cookies, brownies, blondies and tons more all in an instant download! The guide is print friendly too. Click here to learn more! See the other recipes we made here: Pineapple Upside-Down Cake, Apricot Almond Bars, Spiced Apple Crisp, and Apple Cinnamon Doughnuts. And read more about what the GAPS book says about sweets here. Previous Post: « Fermented Cod Liver Oil and Pure Spirulina – enter to win! Wonder if I could sub maple syrup for the honey? (I don’t do well with honey…) That’s an awful lot of sweetener either way! You could :) And it is sweet, but it also calls for a dozen eggs, so it feeds quite a few people. This looks so yummy! You think this could be made without coconut flour?? I used this with half the dough and it came out quite good! Just wondering how substituting almond milk for the coconut milk would work. I don’t know enough about any of it to know. Or could substitute regular raw milk? I don’t have coconut milk and we’ve been wanting to make this but if it would be an issue I will just have to get to the store tomorrow! I get confused when calling for coconut milk.How do you know if it’s the one in a can or carton from dairy section? When recipe calls for coconut milk, how do you know if its the one in a can or the carton from dairy section? Maureen,, I think full fat coconut milk is the canned one. I am just beginning to learn about gluten-free baking. I am wondering about making my own almond meal. I have a dehydrator (just bought it!) — can I sprout raw almonds, then dehydrate them and grind them? I am working to heal my daughter’s gut and hopefully resolve her OCD and moodiness, and want to use organic sprouted nuts and other whole foods. Can I make almond flour for baking the way I described above? 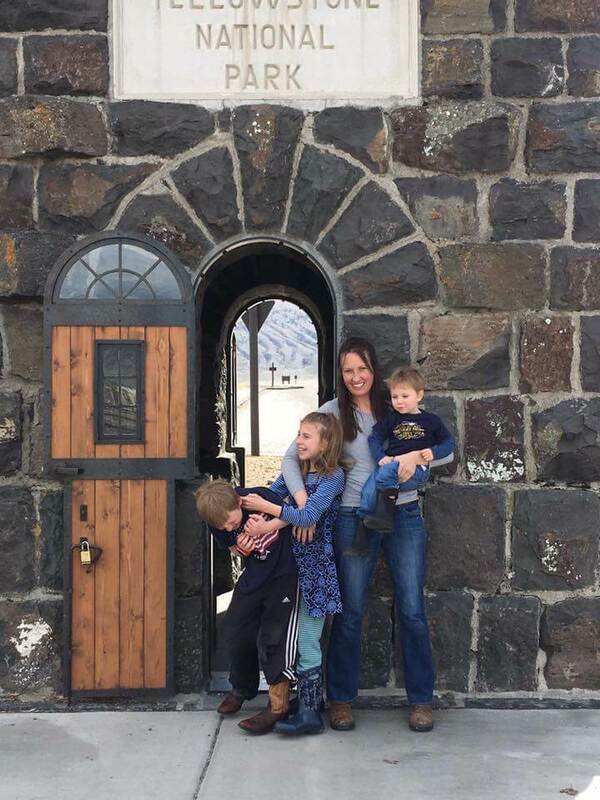 I love your site — very helpful for me as I start this journey with my family. Thank you!